It's your minimum wages, maternity leave, paid holidays, safety at work he's talking about 'deregulating'. Lexiters hang you heads in shame. The good Doctor has been out and about speeking his branes this morning. 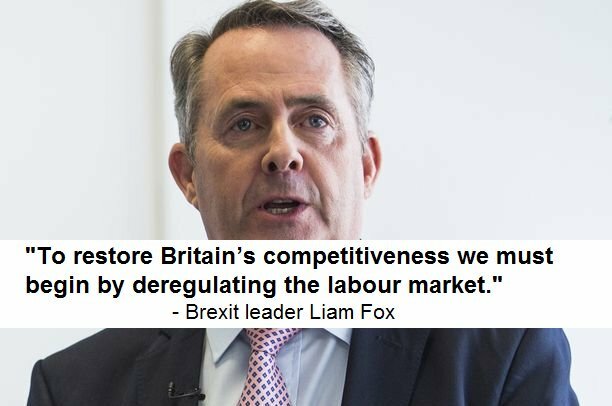 International Trade Secretary Liam Fox: "Some elements of our media would rather see Britain fail than Brexit succeed"
The former top civil servant at the Treasury has told Liam Fox to “get a grip” after he complained that the EU was trying to “blackmail” Britain. Nick Macpherson, who served as permanent secretary at the Treasury from 2005 until last year, tweeted that Dr Fox’s remarks were “the perpetual cry of the smaller negotiator with the weaker hand”. OK. It's time for some optimism. The naysayers got it wrong – and doesn't it annoy you when people preface any piece of good news with the phrase "despite Brexit". Well, doesn't it? So let's just have a reality check. We have the highest number of people in employment ever, "despite Brexit". Last year we had the highest inward investment to the UK ever, creating over 75,000 new jobs and safeguarding over 32,000 others, "despite Brexit". We have new cars being built in Sunderland and Cowley, amongst the highest economic growth rates in the developed world, an 11% rise in exports and the best order books for British manufacturers in 22 years. No, not despite Brexit but because of the sound economic management of a Conservative government under the leadership of our prime minister, Theresa May and chancellor, Phillip Hammond. Meanwhile, all these foreigners are coming here for benefits, and taking our jobs, and we need to deport them? It's Schrodinger's Brexit once again. "Highest number" is an interesting choice of words, isn't it? Bit different from "highest percentage of the workforce in employment". D.C. Harrison wrote: "Highest number" is an interesting choice of words, isn't it? Bit different from "highest percentage of the workforce in employment". And interesting to reflect whether waiting 2 weeks for the next gig is really the same thing as in work. If any minister takes the mickey Fox will serve them their bottle of milk last. That's cos its the board of rough trade. Can he bring a friend?